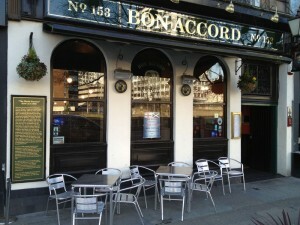 The Bon Accord opened its doors for the first time in 1971 when it was hard to find a pint of real ale in Glasgow. Thirteen years ago the McDonagh family took over the bar and have grown the business to include 380 malt whiskies ranging in price from £3 to £900 per 35ml. We are a multi award winning bar including being voted the UK’s Best Whisky Bar 2014 and CAMRA Bar of the Year for Glasgow seven times. We appear in the good pub guide and the good beer guide and are part of VisitScotland and also offer cellar tours for groups of between 10 and 20 with food and samples. So when you are in Glasgow it has to be the Bon Accord.